I was reading the free online August 2011 issue of Model Railroad Hobbyist (MRH) magazine and found a blog post about the pros and cons of homasote roadbed. I've been using homasote roadbed for at least 40 years. It's still my preferred method for installing either subroadbed on plywood or roadbed on plywood. I've experimented with foamboard and cork but don't like it when handlaying and spiking track although it's alright for commerical tracklaying using white glue or foamboard adhesive. I also don't like mounting switch machines on pads under pink or blue styrofoam. I prefer mounting to plywood with homasote on top. Because homasote is a paper product (pressed from old newspapers and other paper) it will dull saw blades and utility knives quickly. Sawing it creates a lot of dust that gets into everything, almost as badly as sanding drywall. I always work with a respirator when sawing. My method is to cut the 4 X 8 foot sheets outside on the driveway. I set the homasote on top of a garden table so it won't sag when being cut. 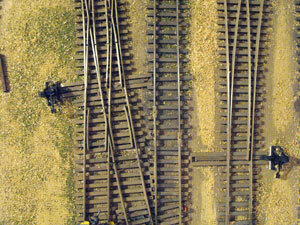 I cut 2 or 2 1/2-inch strips for HO scale single track and 3-inch for double track. Wider, of course, for G scale roadbed. Homasote roadbed without drainage slopes under yard tracks. Ballasting had not been finished. Under yards I use sheets cut to size. I also often use it for building sites that can be inset into the layout after the structure is completed at the workbench. Indoor use of notched homasote roadbed under G scale curve. No drainage slope or ballasting. I use a circular saw with a standard or coarse-tooth blade. I was taught to notch the homasote alternately every couple of inches about halfway into the centre from both sides. This allows the homasote to be bent for curves. The gaps can be filled with plaster, spackling compound or Sculptamold. It is possible to bevel the sides of the straight roadbed by tilting the saw blade. I didn't bother to do this on my indoor G scale layout that sat above the HO layout. Or it can be cut with a sharp utility knife afterwards. Sanding the edges helps. I have also cut slopes after the track has been laid using a utility knife and chisel. This takes time and can be difficult. Homasote would be useless on outdoor G scale layouts because it is a paper product and rain would destroy it. Homasote drainage slopes cut with a utility knife and gouged out with a chisel. Track has been ballasted. The other option is to build up the drainage slopes with plaster and ballast. The blog post warned against using a router. I agree. You'd quickly dull the cutter and there would be even more dust. Some modellers recommend sealing both sides of the homasote roadbed with shellac to avoid expansion and shrinkage due to humidity or water used for gluing ballast. I've never done this and haven't had a problem although I now use isopropyl alcohol and matte medium for ballasting. Other modellers recommend leaving space between sheets for expansion. In my experience I think expansion is due more to the wood than to the homasote. I haven't had problems over the years and our climate here goes from very dry to very humid. Anyway, be cautioned. I avoid butting sheets close together just in case. I leave about an 1/8th of an inch between pieces. The main reason I like homasote roadbed is that it really holds scale size spikes well and I like to hand lay HO track. I now use Fast Tracks Code 83 turnouts when changing or adding track. 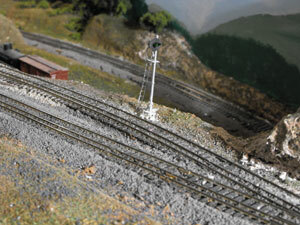 My previous Utopia Northern HO layout still had a lot prefab Code 100 track and turnouts as well as Code 70 sidings. The dual gauge HO-HON3 track work was all Code 70. Most of this homasote roadbed and trackwork had been in place since the 1970s and these sections have been moved three times without a problem. My current Utopia Northern is again being built with homasote sub roadbed. 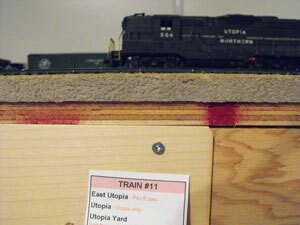 I am using cork under the track and experimenting with Woodland Scenics foam roadbed in a few places. Homasote can be difficult to locate. I found mine at a builder's store in Barrie, Ontario on Dunlop Street. I believe there is still a US company that sells ready-to-use homasote roadbed but it would be expensive to ship it across the border to Canada. Do an internet search to see who sells it near you. If you would like to review the blog post, go to useage of homasote: advanced techniques discussion. It should still be reachable through their website. Return from "homasote-roadbed" to the track page. Return from "homasote-roadbed" to my Home Page.